ABV Govt. 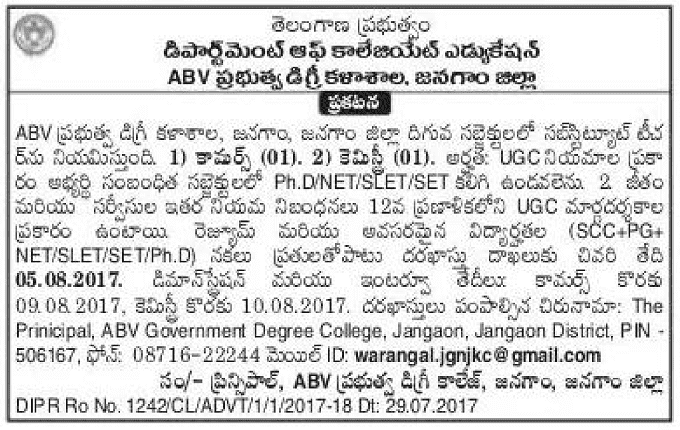 Degree College, Jangaon Lecturers(DLs) Recruitment 2017 notification/ ABV Govt. Degree College, Jangaon Substitute Teacher Posts, Last date for apply: 05.08.2017. ABV Govt. Degree College, Jangaon invites applications for the post of Substitute Teacher to the following subjects. Qualification: Ph.D./ NET/ SLET/ SET (Relevant Subject). Application should be addressed to: The Principal, ABV Govt. Degree College, Jangaon, Jangaon Dist.